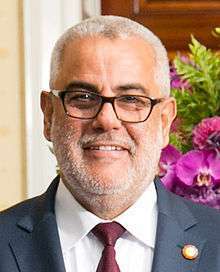 Abdelilah Benkirane (Arabic: عبد الإله بنكيران, born 1954) is the current Head of Government of Morocco, in office since 2011. He is the leader of the Justice and Development Party. Having won a plurality of seats in the November 2011 parliamentary election, his party formed a coalition with three parties that had been part of previous governments, and he was appointed as Head of Government on 29 November 2011. During the 1970s, Benkirane was a leftist political activist. He has represented Salé in the Moroccan parliament since 14 November 1997. He was elected leader of the Justice and Development Party in July 2008, taking over from Saadeddine Othmani. Benkirane's politics are democratic and Islamist. In a 2011 interview he said: "If I get into government, it won't be so I can tell young women how many centimeters of skirt they should wear to cover their legs. That's none of my business. It is not possible, in any case, for anyone to threaten the cause of civil liberties in Morocco". However, he has in the past described secularism as "a dangerous concept for Morocco", and in 2010 he campaigned, unsuccessfully, to ban a performance in Rabat by Elton John because it "promoted homosexuality". His new government has targeted average economic growth of 5.5 percent a year during its four year mandate, and to reduce the jobless rate to 8 percent by the end of 2016 from 9.1 percent at the start of 2012. Benkirane's government has also actively pursued Morocco's ties with the European Union, its chief trade partner, as well as becoming increasingly engaged with the six-member Gulf Co-operation Council. On December 1st, Benkirane slammed the Bashar Syrian administration. "“What the Syrian regime backed by Russia is doing to the Syrian people surpasses all humanitarian limits,” he said to Quds Press. Born in Rabat, Benkirane's family are originally from Fes. His father was interested in Sufism and Islamic fundamentalism, while his mother attended meetings of the women's branch of Istiqlal. Benkirane enjoys chess and music, although he says he is "not in favour of indecent music". His role model is his father, who died at the age of 90, when Benkirane was 16. He is married to a party activist and has six children. His youngest daughter is tetraplegic. ↑ "Législatives 2011: Trois scénarios pour une victoire". L'économiste. Retrieved 25 November 2011. ↑ "Marocco: leader partito islamico, garantiremo le liberta' individuali". Adnkronos. Retrieved 25 November 2011. ↑ "Fin des travaux sur la culture de la réforme au Maroc". Le Matin. Retrieved 25 November 2011. 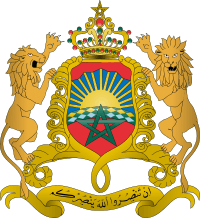 ↑ "Morocco's new govt targets 5.5 pct GDP growth | Reuters". Reuters.com. 2012-01-19. ↑ "Polygamy is not an option, says Morocco Islamist premier's wife". Al Arabiya News. 1 December 2011. Retrieved 2 December 2011. ↑ "النواب حسب الترتيب الأبجدي – الولاية التشريعية 2007–2012". Moroccan Parliament website-. Retrieved 7 January 2013. ↑ "Abdelilah Benkirane élu à la tête du PJD". JDM Magazine. Retrieved 25 November 2011. ↑ Bellem, Rahim (25 November 2011). "Benkiran : "Le Maroc a besoin d'une autre âme, islamiste"". Le Parisien. Retrieved 26 November 2011. ↑ "Abdelilah Benkirane, un islamiste modéré au pouvoir". Le Point. 2011-11-29. ↑ "Morocco PM slams the Syrian regime's crimes in Aleppo". ↑ "Abdelilah Benkirane, l'art de plaire et de convaincre". Maroc Hebdo. 2011. Retrieved 2012-01-02. ↑ "'I do not force my daughters to wear the veil,' says head of Morocco's Islamist JDP head". Al Arabiya News. 30 November 2011. Retrieved 1 December 2011. Wikimedia Commons has media related to Abdelilah Benkirane.